Jackie is 5’1″. One of the two teen-sized rifles made for me by Doublestar fit her perfectly. Although she’s shot AKM47 before, she said those were rather large and heavy. Fitting the rifle to her stature ought to make for a more enjoyable range trip. 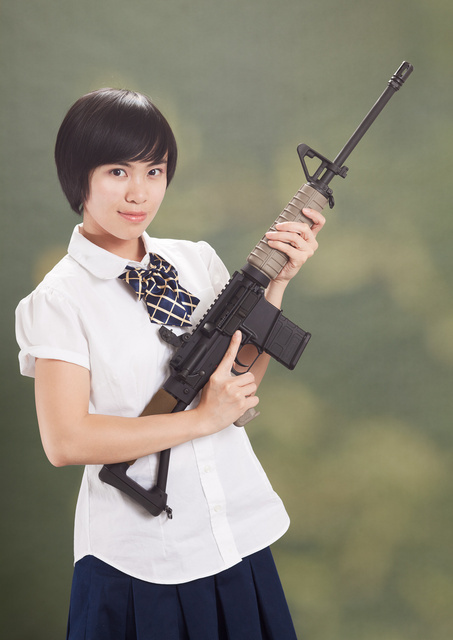 This entry was posted in interesting people, rifle, weapon and tagged 223, AR15, cute, Doublestar, schoolgirl, white. Bookmark the permalink. Never been that big a fan of the Ace stock. My Daughter, who is 10 and about 4’10” can shoot my midlength as long as the M4 style stock is on the shortest detent. The Ace stock is less flexible but much more robust. And when shooting in the cold, much, much more comfortable. But I will agree, it wither fits you, or it does not. Cute girl, good lighting, nice blur on background. Walnut is “comfortable” the Ace is “squishy”. I’ve shot with the Ace before, a good friend has one on his SBR.